The Portascreen shower guard makes containing shower spray simple. Portascreen Shower Guard...The Portascreen shower guard makes containing shower spray simple. Portable and easy to handle, the Portascreen folds flat for storage and is supplied with a carrying case. 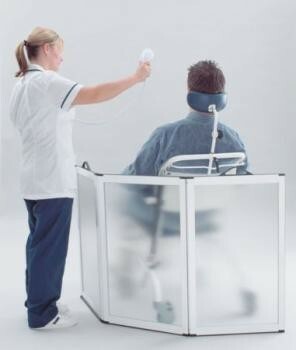 The hinged doors are easily moved and positioned to provide maximum protection for the carer when assisting with a shower. Total length 1474mm (4 10"). Size when folded 530 x 815mm (21 x 32").